Little did we know that Fox News was full of Australians all along. 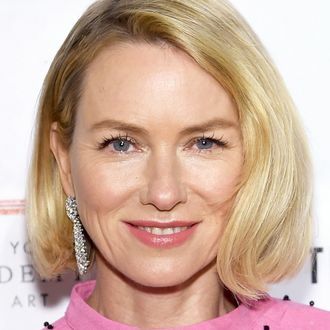 Showtime has announced that Naomi Watts is going to play Gretchen Carlson in its upcoming limited series about Fox News founder Roger Ailes, which stars Russell Crowe. Showtime’s series is based on Gabriel Sherman’s book The Loudest Voice in the Room. According to Showtime’s release, the series will focus primarily on the past decade, but also include flashbacks to earlier moments in his career. Carlson was a key figure in the end of Ailes’s reign, as she was the first woman to file a sexual-harassment suit against him, which led to his firing. As it happens, Watts isn’t the only actress who’s supposed to play Gretchen Carlson in a high profile project, or even the only Australian. Nicole Kidman has signed onto Annapurna’s Megyn Kelly movie, which stars Charlize Theron as Kelly and has cast Margot Robbie as an associate producer at the network. Two blonde actress best friends playing the same role in the same time period — David Lynch would be thrilled.